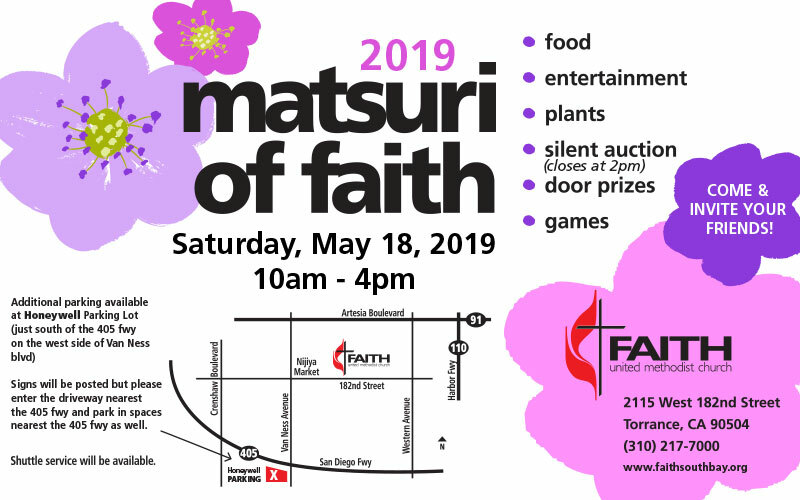 Join us for our Matsuri of Faith festival at Faith United Methodist Church, Saturday, May 18th from 10am to 4pm. Come taste a variety of ethnic foods, including smoked Tri-Tip Sandwiches, Lau Lau, Kalua Pork, Gourmet Hot Dogs, Curry, Udon, Chinese Chicken Salad, Malasadas, Hawaiian Shave Ice, and home-made baked goods, to name a few. In addition, there will be plants for purchase and don’t miss our fabulous Silent Auction! Enjoy children’s games, door prizes, and great entertainment throughout the day, including hula and taiko drum performances and much, much more! The parking location is at Honeywell parking lot (west side of Van Ness Blvd just south of the 405 fwy). There will be a free shuttle service – look for the signs! All are welcome. Faith United Methodist Church, 2115 West 182nd Street, Torrance, CA 90504.